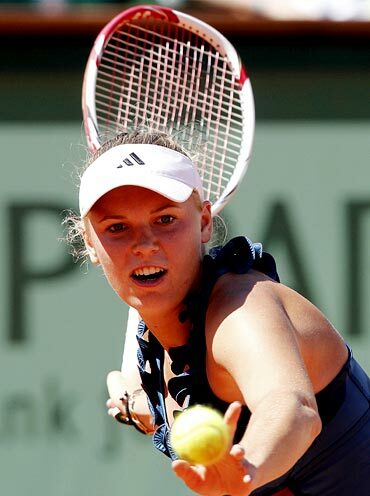 World number one Caroline Wozniacki powered into the French Open third round with a 6-3, 7-6 win over Canada's Aleksandra Wozniak on Wednesday. On a hot start to the day, the top seeded Dane dominated her near namesake at the start with two early breaks and although she dropped her serve late in the first set she was always in command thanks to her fierce forehand. Wozniacki, yet to win a Grand Slam despite her top ranking, stuttered slightly in the second set and Wozniak was annoyed by a line call which cost her a set point before the Dane came from behind to win a topsy-turvy tiebreak. Wearing a blue dress which matched the totally clear sky, Wozniacki again wore strapping on her left thigh but it appeared to give her no discomfort. 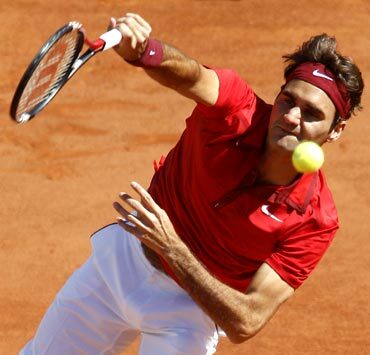 Roger Federer was a man in a hurry as he battered French wildcard Maxime Teixeira 6-3, 6-0, 6-2 in the second round. The third seed suffered none of the bother that befell rival Rafael Nadal on Tuesday when the Spanish champion outlasted John Isner in his first five-set match at Roland Garros. Federer sloppily lost his serve once in the first set but the Swiss was otherwise in good form and made Teixeira look extremely ordinary. The 2009 winner is scheduled to meet red-hot Novak Djokovic in the last four if the pair keep up their impressive starts to the claycourt Grand Slam. The heat and a plucky opponent initially left 17th seed Julia Goerges frazzled as she fell a set and 3-1 behind. But the in-form German, who won the Stuttgart tournament and reached the last four in Madrid during the past few weeks, relied on her survival instincts to floor Czech Lucie Safarova 2-6, 7-5, 6-2. Goerges, however, did not let the win go to her head. Asked who she would pick as the tournament favourite, she quipped: "For sure not me." The 22-year-old, dubbed "Gorgeous Goerges" by some members of the press, has also been hailed by success-starved German tennis fans as the new Steffi Graf after a dearth of talent since Graf won the last of her 22 grand slam titles here in 1999. In typical style, Goerges is not interested in the comparisons. When a reporter asked who was her idol assuming she would say Graf, she replied with a dead straight face: "Martina Hingis." Samantha Stosur barely broke sweat as she sauntered into the third round after an emphatic 6-0, 6-2 win against little-known Romanian Simona Halep in 66 minutes. 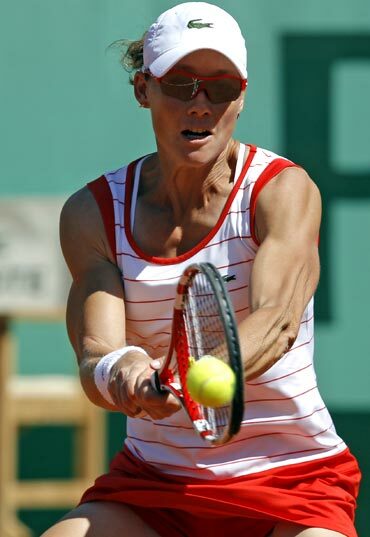 On kids day at Roland Garros, the eighth-seeded Stosur was in no mood to fool around as her pace and kicked serve proved too much to handle for the world number 67, who bowed out when she mishit a crosscourt forehand.